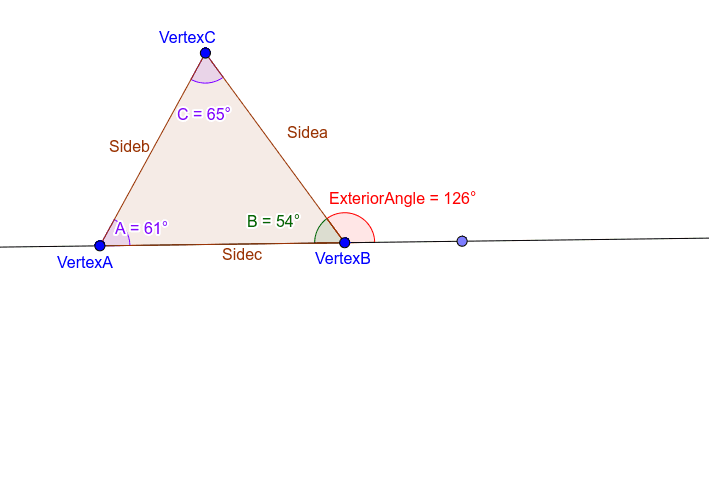 The only vertex that you are allowed to move on this screen is Vertex C. As you move vertex C to create different triangles, pay attention to the relationship between the exterior angle (red) and the sum of angles A and C (the two purple angles). Each time you move Vertex C, record the exterior angle (the red one) and then add the two angles which aren't touching the exterior angle (these are purple). After doing this a few times, write down your conclusion. This is known as the exterior angle theorem. Explain why the angles marked on the triangle above cannot be accurate. Relate it to the exterior angle theorem that you just investigated as well as any other information that you have learned about triangles.